The tax-assessment process can be somewhat confusing for property owners. To have a better understanding of the way in which property taxes are determined, we have defined the following tax-related terms and have indicated the effect each has on your taxes. The assessed value of a property is that value attached to the property for tax purposes. Having an increase in one’s assessed value doesn’t automatically mean an increase in taxes—more factors come into play than simply assessed value. Tax payers share some of the cost of running state, county, and local government—all done through the levy process. A levy is the total amount of money to be raised by taxes to cover the operating budgets of those governments, including school districts and vocational/technical schools in that jurisdiction. The amount of money levied by each government affects how much tax you pay. The amount you pay in property taxes is determined by how much spending occurs by state and local governments, which in turn affects the amount of money to be levied to cover that spending—if the tax levy changes, your property tax will change, as well. The “mill rate” (called a “tax rate” in some states) also affects your taxes–it’s part of the formula used in Wisconsin to assess real estate taxes. Each “mill” represents $1 of tax assessments per $1,000 of assessed property value. Benton’s mill rate, for example, is .02517522. That means that a home with an assessed value of $100,000 would pay $2,517.53 a year in property taxes ($100,000 x .02517522 = $2,517.53). Mill rates are determined by the individual levies from state, county, and local governments—including the school districts and the vocational/technical colleges within the jurisdiction. Mill rates do not always stay the same. They are sometimes adjusted–an adjustment that can either be adjusted up or down. A property’s market value is the most probable price a property would bring in a competitive, open market. Market value isn’t used to calculate your property taxes. The lottery credit is just what it says it is—a “credit.” It’s money “returned to you” as a credit on your tax bill. It applies to owners of a home in Wisconsin who use that home as their primary residence on January 1 of the year in which the property taxes are levied. The lottery credit, then, helps reduce the amount of property tax you ultimately owe. Tax bills are issued to property owners in December of each year. They may be paid in two installments: one due by January 31st of the year, and the second due by July 31st. Property owners not paying their first installment on time, however, are not allowed to defer the second half of their taxes–they must pay the entire tax bill, along with any penalties derived from the late payment. 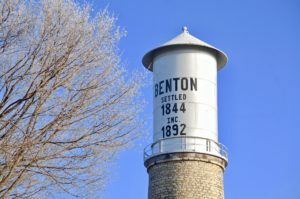 The first half of your tax bill is payable to the Village of Benton and the second half payable to Lafayette County.